In recent years, English classes have begun in elementary school. There are many private schools where English instruction begins even as early as first grade. 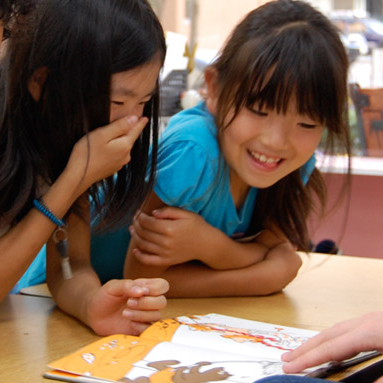 Unlike infants whose language skills are still in the early stages of development, elementary school students usually first process the new English they learn through the context of Japanese language. In our classes, we learn not only vocabulary, but phrases for day-to-day life that emphasize the natural sounds and rhythms of English. Rather than relying on rote memorization of spelling, we emphasize phonics instruction. By learning the "sounds of the alphabet", students learn to recognize and read those sounds in words. By master phonics, students also develop correct English pronunciation, which can be very helpful when studying for Eiken and other language exams. Learning English in elementary school allows students to make the transition to English instruction in junior high with ease. The main advantage of learning English in elementary school is developing an "ear" for English sounds, which will aid listening and speaking skills in the future. Learning English from a young age is very important, but to elementary students, play is also very important. In our classes, we use active and fun games to practice new vocabulary and sentence patterns. 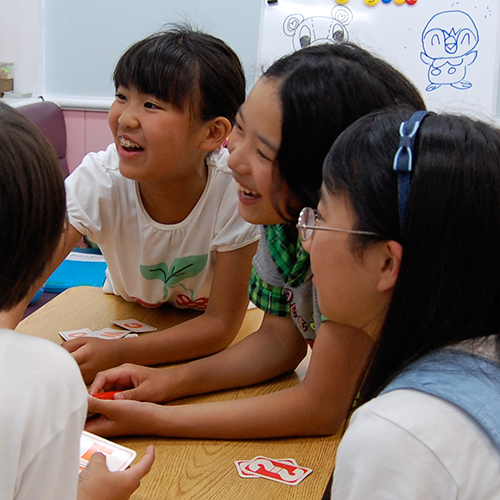 Through play and communicating with native speakers in class, children gain confidence and pride in their English skills. Furthermore, giving children the opportunity to make friends with people from different cultures is very important for children to survive and thrive in the international community. Language is not something that can only be learning while sitting at a desk. When using a newly-learned word to communicate something to another person, and the idea is conveyed, that is the moment when the awareness of the meaning of that word becomes alive in the student's mind.